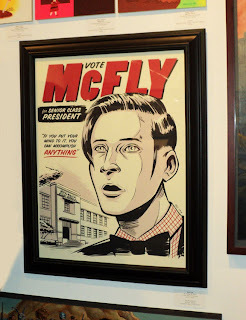 The Art (and Random Adventures) of Eric Tan: McFly for Sale! A HUGE thanks to everyone who traveled to Gallery 1988 for the Crazy4Cult opening. It's always cool to see that show come together and enjoy the different interpretations of all the cult films. For those of you unable to make it, the show is now online at Gallery 1988. And you can also purchase my 'In George We Trust' print HERE. 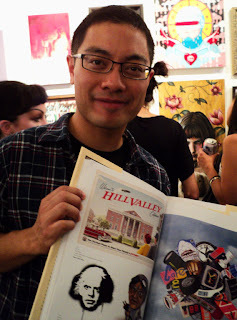 The Crazy4Cult book is also available (that's me holding it) on their site. It collects work from the previous 4 shows and is a pretty wicked read if you ask me. Love the new poster! Just ordered it from Gallery1988 :) It will hang next to my hill valley print. Thanks so much Simon! I'm glad you scored both prints. And as far as next year, well you already read my mind. It's good to meet fellow BTTF fans such as yourself and know I have a built in audience if I decide to keep the series going. What I love about both BTTF prints is they're both posters; they're almost like lost scene dressing. I also like the fake folds on them. Next year you could always move onto Future posters from 2015, or Biff's Casino. The show was awesome! My friend and I totally missed you by the time we got inside. Awesome poster nonetheless! Hi there, I really LOVE your "In George We Trust" poster, any chance I can pick up a print somewhere? They are all sold out on 1988. It has special meaning to me because I jokingly call my fiance McFly. Will pay extra! Thanks! Just curious, but how did your fiance ever get that nickname?? It's hilarious!